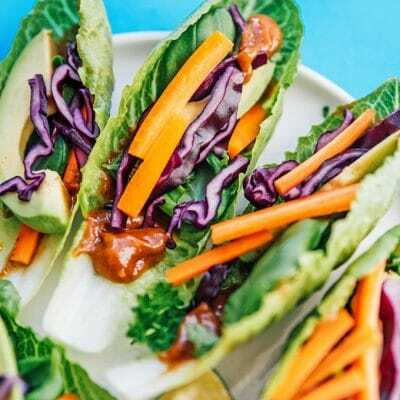 This Fresh Veggie Lettuce Wraps recipe is packed with colorful veggies and drizzled with an Asian-style almond butter sauce. They’re low carb, easy to make, and surprisingly addictive! Tortilla wraps and bread and buns are great and all, but sometimes they’re just a crutch for the mediocre fillings inside. But when the fillings are fresh and flavorful (and involve a killer sauce), you don’t even need bread. And that’s where lettuce wraps come in! 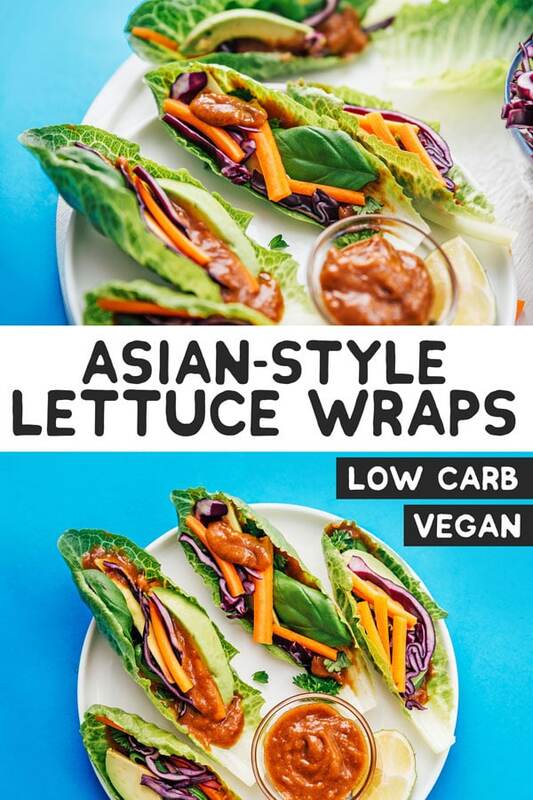 Lettuce wraps a healthy low carb swap for tortillas (if you do it right)! Today we’re using them to create an even lower carb version of my favorite spring rolls. Loads of fresh raw veggies, a bunch of herbs, and the most addictive Asian-style almond butter sauce to finish it off! Lettuce Leaves: The best lettuce for lettuce wraps are going to be either mini romaine (seen in the pictures) or butter lettuce. 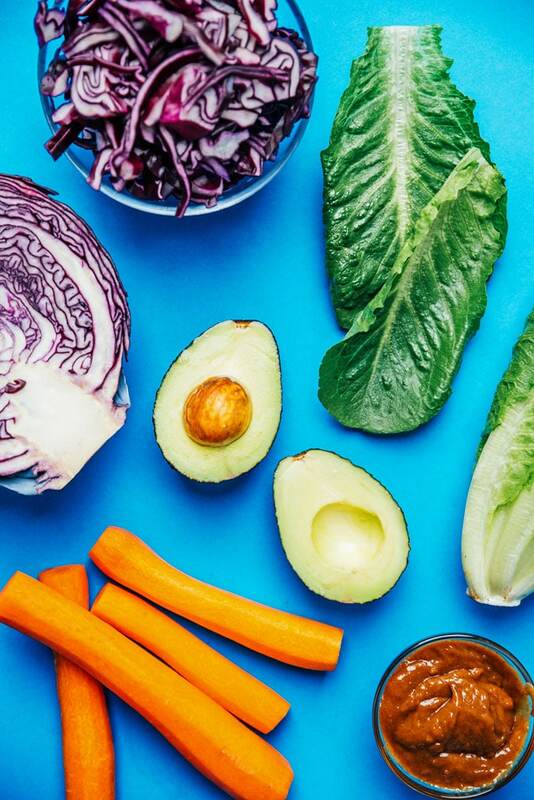 Crunchy Veggies: Julienne cut crunchy veggies help make these lettuce wraps more filling. Cabbage, carrot, bell pepper, and radish are all great in these. Avocado: A ripe avocado is essential in this recipe! It helps to make the lettuce wraps more creamy (and less like a literal pile of vegetables). Herbs: Be generous with the fresh basil and parsley! You can also use cilantro here. Asian-Style Almond Butter Sauce: This best-ever almond sauce is the cherry on top. It’s flavored with soy sauce, ginger, and lime! There’s no need to fuss with rolling these up. Just chop all your fillings then spoon them into your lettuce (either mini romaine or butter lettuce), like a little lettuce boat! 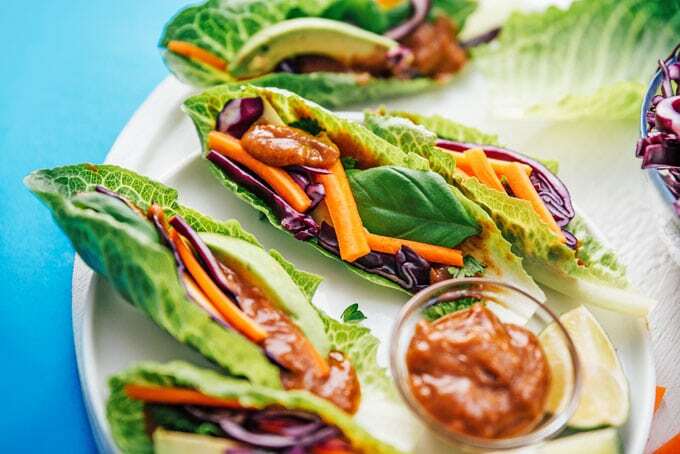 If you find your veggies falling out, try spreading the almond butter sauce onto the lettuce leaf first, then filling with your veggies. The almond butter sauce acts like a glue and keeps everything together! 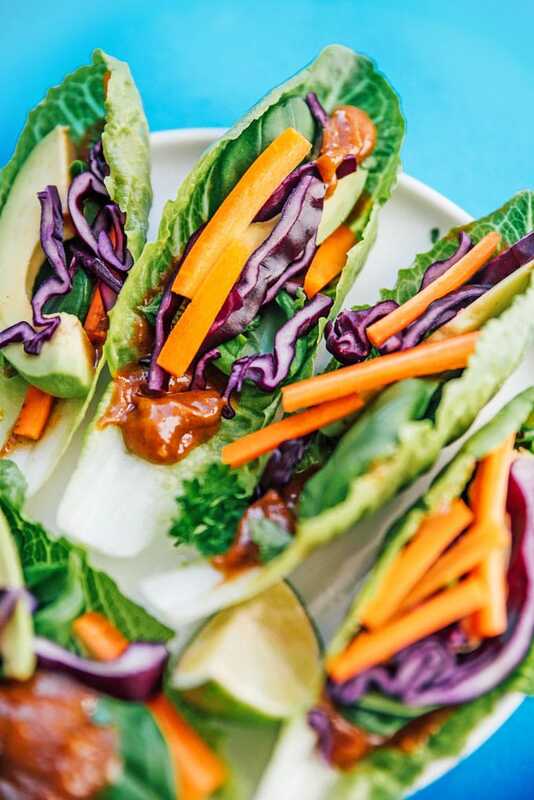 This Fresh Veggie Lettuce Wraps recipe is packed with colorful veggies and drizzled with an Asian-style almond butter sauce. Sauce: Combine all “Sauce” ingredients in a small bowl. Prepare: Carefully remove as many intact lettuce leaves as you can. Rinse them off and set aside. Thinly slice all remaining veggies and roughly chop herbs. Assemble: Spread a bit of sauce onto the center of each leaf, then top with sliced veggies and herbs. Enjoy! *If following a strict low carb diet, the honey can be omitted. 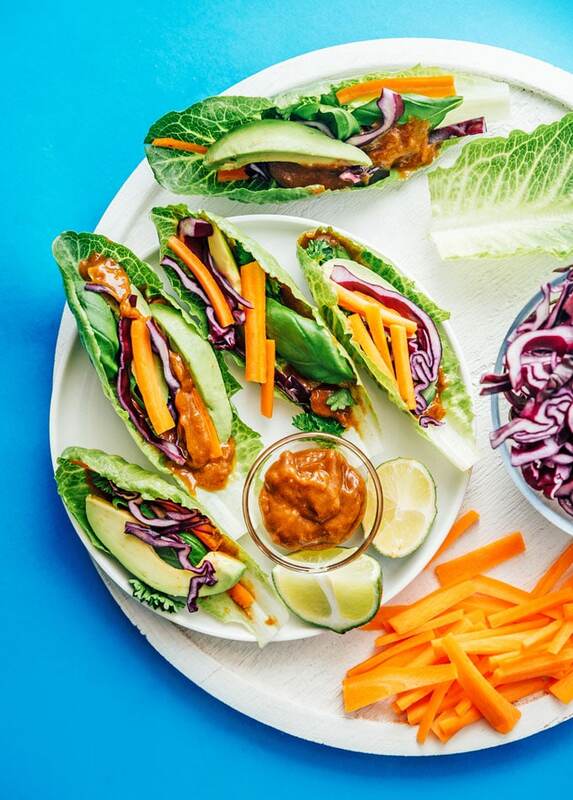 Thanks so much for dropping by and for making tasty bites like this Fresh Veggie Lettuce Wraps recipe possible!